Currently transiting to Panama from the Virgin Islands, the 42.67m motor yacht Just Enough is available to charter in the San Blas archipelago in May through Daphne d'Offay at Ocean Independence. 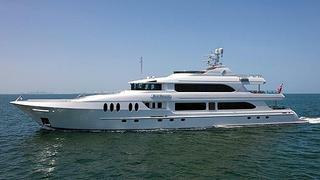 Custom-built with charter in mind, she’s filled with the amenities most desirable to charter guests. Features include a water slide, spa pool, state-of-the-art sound system and a 32’ Sportfish tender. Other features include zero speed stabilisers for guest comfort, VSAT and an eco-friendly water system. Just Enough boasts five cabins including a main deck master suite and can accommodate up to 11 guests. Weekly rates start from $135,000.